Burnley have signed Hungary international goalkeeper Gabor Kiraly on a two-year deal, with the Clarets having an option for a third year. The 31-year-old was recently released by Crystal Palace after 111 appearances in three years at Selhurst Park. He originally joined the Eagles from Hertha Berlin in 2004, and also had a loan spell at Aston Villa last season during a goalkeeping crisis. 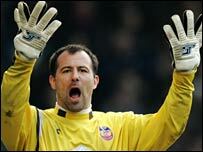 Kiraly is Clarets boss Steve Cotterill's first summer signing.